Think of a mighty river, flowing, moving gently but firmly around any obstruction in its path. Like life itself, it is ever-changing. As a Greek philosopher stated thousands of years ago, you cannot step into the same river twice. Tai Chi has these qualities. In going through the form, you become the flowing river; natural, gracious and powerful. You are present in the moment and at the same time the dance is eternal, hundreds of years ago in places far away that same dance was unfolding, as it is now and as it will be, in the future. Tai Chi Chuan has a long and interesting history, most of which may well be legendary. Was it really created by Chang San Feng after watching a crane do battle with a snake, back in the mists of time? Or is it an ongoing stylistic development from origins in Chenjiagou village, where at one time (about thirty years ago) a government census reported that 2500 villagers out of a total of 3000 were active Tai Chi practitioners? Nearly everyone in this village shares the surname “Chen”, thus this Tai Chi style has become known as “Chen Style Tai Chi Chuan”. A man called Yang Lu Chan learnt it there in the nineteenth century, brought it to Beijing, changed it significantly (thereby creating Yang style Tai Chi Chuan), and taught it widely. His sons and grandsons further spread the art and it is this Yang Style which was what first became available in “the West” as “Tai Chi”. Chen style and other previously unknown variations such as Wu Style, Sun Style, Hao Style and Hwa Yue Tai Chi have also started making their appearance outside of China in the last twenty years or so. Personally, I don’t believe that the history is of primary concern. As with Qigong and Hsing Yi Chuan, you feel the benefits within yourself after a fairly short period of practice, this is what matters! Tai Chi is second only to Qigong in terms of the millions of practitioners it has in China (Qigong is quicker and easier to learn initially and suitable for the very old, plus the Chinese government promotes it more heavily as a form of preventative health care). Ask anyone who has traveled to the Far East and they will tell you of the public parks filled every morning by people moving gracefully through their Tai Chi form. In a Tai Chi class, you will go through some gentle warm-up exercises and stretching, some Tai Chi-specific Qigong energy exercises, then you will proceed to learn the movements that make up the Tai Chi form and, once you have practiced that for a while, you will learn “push hands”, “Gen Gung”,“Ta Lu” and possibly some weapons forms also. “Push hands” is a partner exercise in which you and your practice partner sense each other’s movements and attempt to “find the other person’s center” and, by doing so and adding a gentle push, off-balance each other. Historically speaking, push hands is and was a superbly inspired piece of training methodology. Tai Chi, as a martial art, is a close-range fighting system (as opposed to, for example, Tae Kwon Do with it’s emphasis on kicking, which makes it a long range system). Practicing powerful close range strikes within full contact sparring leads to combative ability but also creates a lot of wear-and-tear within the human body. Push hands, performed in a certain way, produces some of these results with nearly no wear-and-tear, in other words, it’s a highly effective trade off. The Tai Chi style I teach is a version of the Yang style, although, to be precise, it is a Yang style “bottle” (i.e. the outer form) containing a Hwa Yue Tai Chi (also known as “Liu He Ba Fa”) “wine” (i.e. the internal dynamics, the use of the body, energy and mind). This particular synthesis came about in Fatsan, Canton where my first Chinese Martial Arts instructor, Mr. Fok Si Yue, learnt from his two instructors, Mr. Chan Gan and Mr. 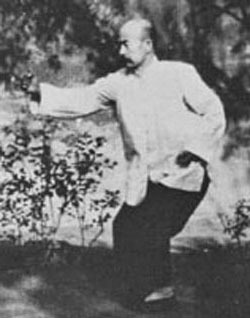 Au Wen Goy(Au Wen Goy was also a Yang Style Tai Chi student of the famous Tung Ying Chieh). Both of these were students of Mr. Leung Tze Pang, who in turn was a student of the legendary Wu Yi Hui. I cannot express the depth of my gratitude for this teaching! Tai Chi, like Yoga, sells itself to those that are attracted to it and have done a few sessions. In wanting to share what this practice has given me, the trick of course is to motivate someone so as to have them take part in a session or two. It’s simple, really: the classic writings tell us that Tai Chi gives you “the strength of a lumberjack, the pliability of a child and the wisdom of a sage”. Irresistible, isn’t it? See you at practice!